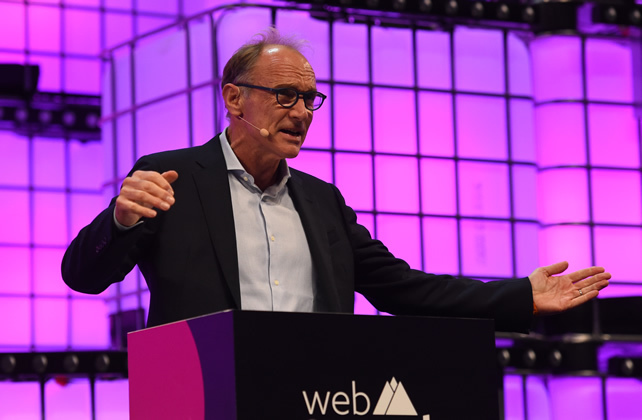 The inventor of the World Wide Web on Monday called for a “ contract” to make internet safe and accessible for everyone as Europe’s largest tech event began in Lisbon amid a backlash over its role in spreading “fake news ”. Some 70 ,000 people are expected to take part in the four - day Web Summit, dubbed “the Davos for geeks”, including speakers from leading global tech companies , politicians and start - ups hoping to attract attention from the over 1 , 500 investors who are scheduled to attend. Tech firms now find themselves on the defensive , with critics accusing them of not doing enough to curb the spread of “fake news ” which has helped polarise election campaigns around the world and of maximising profits by harvesting data on consumers ’ browsing habits . British computer scientist Tim Berners - Lee, who in 1989 invented the World Wide Web as a way to exchange information , said the internet had deviated from the goals its founders had envisaged . “All kinds of things have things have gone wrong . We have fake news , we have problems with privacy, we have people being profiled and manipulated,” he said in an opening address . Berners - Lee, 63 , called on governments, companies and citizens to iron out a “complete contract” for the web that will make the internet “safe and accessible ” for all by May 2019 , the date by which 50 per cent of the world will be online for the first time . He has just launched Inrupt , a start -up which is building an open - source platform called “ Solid” which will decentralise the web and allow users to choose where their data is kept , along with who can see and access it. Solid intends to allow users to bypass tech giants such as Google and Facebook. The two tech giants now have direct influence over nearly three quarters of all internet traffic thanks to the vast amounts of apps and services they own such as YouTube, WhatsApp and Instagram . Tech giants are also under fire for having built up virtual monopolies in their areas . Amazon accounts for 93 per cent of all e - book sales while Google swallows up 92 per cent of all European internet- search ad spending..“I think technology is going through a funk … it’s a period of reflection,” Web Summit founder and CEO Paddy Cosgrave told AFP .